A turquoise butterfly flutters by. Ibis and small birds fly freely over the treetops. The croaking of frogs, the twittering of birds and the calls of apes can be all heard over the thundering waterfall. It’s hot and humid. Welcome to an 18,000 cubic metre, green rainforest cube! From the misty mountains of the Andes to the Amazon River delta, the South American rainforest spreads outs like a giant green carpet. This rainforest is home to a richness of species that can’t be found anywhere else on Earth. Except maybe in Gothenburg. Universeum’s rainforest is a model of a South American tropical rainforest, also known as a Neotropical rainforest. It’s really hot and sweaty in here! The temperature in a Neotropical rainforest is a constant 20−25 degrees Celsius the whole year round. But the relative humidity, which is often over 90 per cent, makes the temperature seem even higher. You’ll experience this yourself when you enter Universeum’s green adventure. In this exhibition you’ll learn a whole lot about the animals, plants and people in the rainforest. And you get to see the part you play in the survival of the rainforest. What can you do to help preserve the world’s rainforests? Use rickety suspension bridges, winding stairways and narrow passages to get to the new kapok tree! From the Treehouse at the top, 25 metres above ground, you get a breathtaking view of the rainforest canopy. At the top of the Rainforest is Sloth Mountain, where our sloths, common marmosets and red-bellied piranhas live. The sloth Annika was sexed as a female at birth. But she turned out to be male, and now Annika lives together with the female Tallina! You’ll find the Canyon on level 2 in the Rainforest. The Canyon is teeming with small birds, butterflies, frogs and lizards! And there’s a large number of wild plants, all with a story of their own to tell. Here you’ll find Goeldi’s monkeys, pied tamarins, white-tailed jays, dwarf caimans and tortoises. But these are only a few of all the animals that call the River Temple their home. The temple ruins are inspired by the tombs of the Chachapoyas. The sloth is naturally lazy and slow. It can turn its head 270° in order to reach leaves, buds and shoots from trees without having to move its body. A little fellow, around 18 cm in length and 250 g in weight. A specialised appendix lets it feed mostly on sap and insects. The pied tamarin exists in only one place on Earth today: in and around the city of Manaus in Brazil. They are threatened both by the destruction of the rainforest and by the many dangers in the big city. All pied tamarins belong to the Brazilian government. One of the world’s largest freshwater fish. It can grow to 4.5 m in length and weigh 200 kg. As an adult, it only breathes with its swim bladder instead of through its gills. Because of this, it has to surface every now and then to get air. Enjoys hot and humid environments. If it gets too arid, it burrows and waits for rain. Eats pretty much everything that crosses its path, from windfalls to insects and dead rodents. The largest of all the toucans. Its bill has a network of superficial blood vessels that enables the toucan to regulate its body temperature. If the sunbittern feels threatened, it hisses and opens out its wings with the upper side towards its adversary. The two “sunspots” then look like a pair of large, staring predator’s eyes. A terrifying combination! Nocturnal. Lays its eggs on leaves overhanging pools of water. This allows the larvae to drop down into the water once they hatch. Can communicate with 40 different calls, but is not especially noisy. They move around by leaping between trees. They can travel as far as four metres in a single leap without losing any height. At night it waits in ambush on the surface of the water for small animals that, unaware of the danger, come to the waters’s edge to drink. Formerly known as the purple tanager due to its brilliant plumage. Often lives in coastal forest, but can also be found in cities such as Rio de Janeiro. In a rainforest, the decomposition of dead plants and animals is very fast. Organisms that help in the process, such as fungi, bacteria, worms and insects, thrive in the hot and humid environment. Nutrients are released into the ground or are absorbed into the tissue of the organisms. This is what’s behind one of the most important ecological processes in the tropical rainforest. A fast decomposition equals a fast release of nutrients! To obtain the typical vanilla flavour, the almost ripe fruit must first be fermented and then dried. It is a long process, making vanilla our most expensive spice after saffron. A popular houseplant that originates from the South American rainforest. Under the right conditions monstera can bear fruit, which tastes like a mixture of pineapple and banana. The indigenous population often cook their meat wrapped in leaves from the papaya tree or together with the seeds from the fruit to make it tender. The enzyme papain is released and tenderizes the meat. The fruit has a hard, leathery shell that can be dried and used to make bowls and musical instruments, among other things. Not to be confused with the calabash gourd plant, as they belong to two completely different plant families. The rainforest used to form a continuous, green and steaming belt around the entire equator. It’s not like that anymore. Over 160,000 square kilometres of rainforest is cut down every year. That’s roughly 37 football fields every minute. Our soya cultivation, oil palm plantations, dam building and large-scale meat production is about to completely destroy an ecosystem that researchers believe has existed for 60 million years. Today, only half of the rainforest that grew a hundred years ago remains. Large, continuous forests can be found in South America, Africa and Asia. The largest is Amazonia. Why an Amazonia in the heart of Gothenburg? 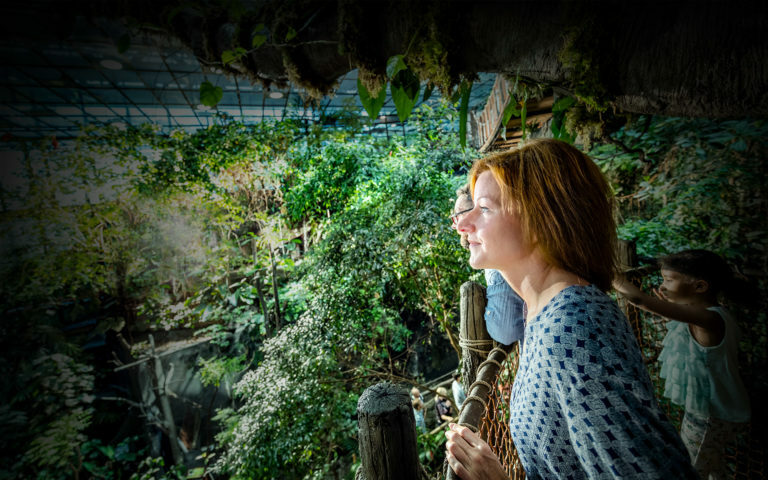 Universeum’s rainforest was built to engage people in preserving biological diversity. We believe that you have to experience nature up close in order to really understand how exciting and important it is. We also want to show that an education in science and technology enables you to work with preserving the rainforest and its biodiversity. This exhibition also aims to spread knowledge about, and interest for, Swedish forests and animals. Our own part of nature also needs our care.